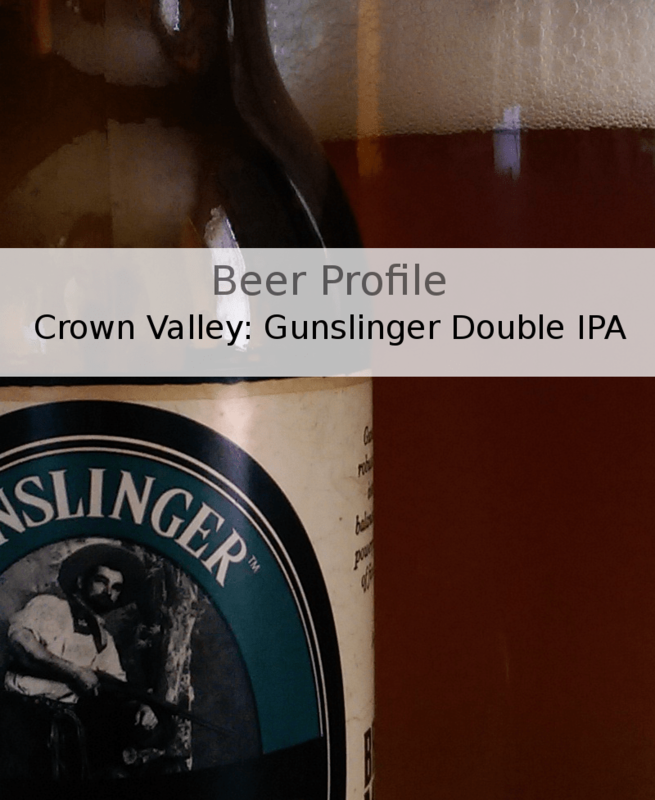 Beer Profile: Crown Valley Gunslinger IPA – Food. Beer. Stuff. Crown Valley Gunslinger Double IPA. 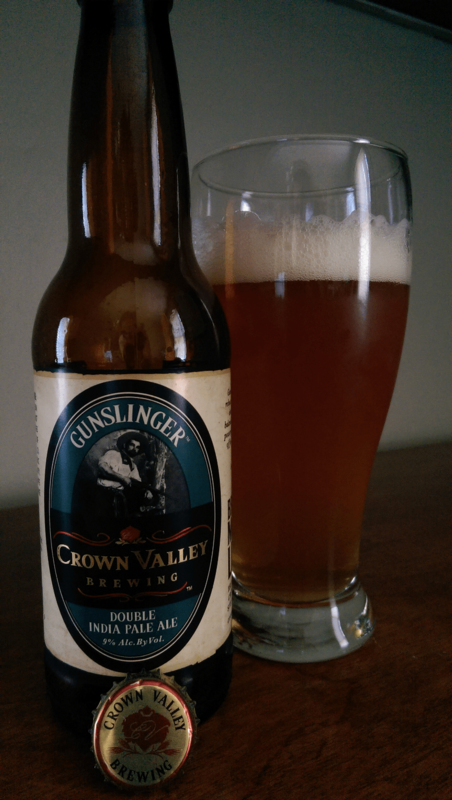 In today’s Beer Profile we take a look at Crown Valley Brewing Gunslinger Double IPA. Crown Valley Brewing is a 15 barrel Micro-Brewery located in Missouri that offers eight different ales, three styles of lagers and three hard ciders. 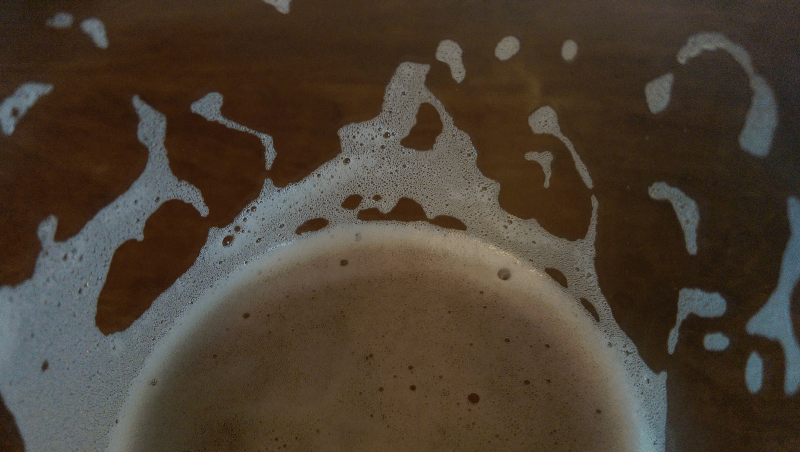 Ran by Brew Master Jeremy Gilbert; Crown Valley Brewing was first established in 2012. Gunslinger is one of two IPA offerings from the brewer. Crown Valley’s Double IPA comes in the normal long-neck brown bottle featuring a Gunslinger with rifle ready. This Double IPA pours a brilliantly hazy golden amber with an easy two finger head that dissipates quickly into a foamy topping. The nose picks up citrus aroma’s with pine and sweet malts. Gunslinger IPA pours a hazy golden amber. My nose picks up more hop aromas as I take the first sip. The crystal malt sweetness hides the 9.1% ABV nicely. The 5 hop varieties used during the brew are quite present giving a good balance to the finish. Gunslinger Double IPA goes down easy. For a medium bodied beer, I find it very drinkable. The moderate carbonation helps this chewy beer lighten up. As I continue drinking I find the hops take on more of the flavor giving this IPA a nice hoppy balance. Dancing lace dries to the glass after each sip. This Double IPA really does go down easy. The intense hops play quite nicely with the crystal and pale malts giving a well balanced resiny medium bodied brew. I have been saving my Gunslinger for IPA Day (8/7/14) and I am happy I did. Gunslinger makes a great start to what will be a fun day of IPA’s. At 9%, gunslinger could be quite dangerous for the uninitiated. The sweet malts and hoppy profile mask the alcohol content well. I find this Double IPA to be a great example of the style with a nice piney character IPA fans will be sure to enjoy.